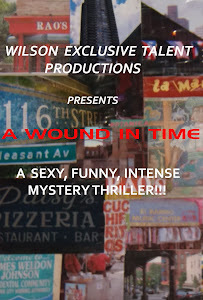 A WOUND IN TIME: THE CRITICS HAVE SPOKEN! Wilson Exclusive Talent Productions presented a very special Creole dinner theatre event at the exciting gallery/food space Culturefix on 9 Clinton Street near Houston St. A scrumptious three course dinner was followed by Stephanie Lynn Wilson's play "Blood Makes the Red River Flow". The appetizer was black-eyed pea fritters with (heavenly) crawfish cream. The main course featured Chicken and okra gumbo, dirty rice, skin cracklings, and homemade hot pepper sauce. The sausage studded dirty rice was the most delicious rice I've had in ages and the okra was tasty but not slimy. The desert pina colada cake with pineapple rum glaze and maraschino cherries alone would have been enough to completely satisfy me. Ms. Wilson's play which she also directed and played the significant wise maternal figures Guma and Yaya, explored the rich culturally diverse milieu of Louisiana pre and post Louisiana Purchase. Beautiful black women had the best chance for a financially secure future if they could secure a protector at a special ball. Lizette (Christiana Blain) attracts Ferdinand (Ron Rivera) a wealthy owner of a plantation in Cuba. Her mama (Ms Wilson) is an astute businesswoman who makes sure to get favorable contracts assuring that the property will pass to Lizette and any future generations. A subplot involves Lizette's friend Marie (Krystal Hill) who must flee to Mexico with her brother who was caught passing for white. Another subplot involves an escaped slave Rebeau (Chuk Obasi) who, as a freeman works for Ferdinand and Lizette. Rounding out the cast is the mother's French friend played by Al Roffe. Becoming part of the United States compromised the former freedom of the heterogeneous colored population of Louisiana, but as Ms. Wilson showed they often found ways to help each other with the relatively privileged (Lizette) helping the not so privileged: Rebeau and her friend Marie.. The combination of Creole dinner with this rich history play worked wonderfully to enhance each other. I hope this dinner theater combo gets another chance to enchant a wider audience. If they do get another chance, perhaps some minor technical issues can be addressed. The background music was too loud, often swallowing the dialogue. Long pauses made the scene transitions awkward, especially because we were all eagerly waiting to find out what would happen next. As Natasha and Pierre and the Great Comet of 1812 has shown, New Yorkers love dinner theater, so look out for this one when it comes around again. I completely concur with Mark Savitt's review of show and food. Free Man of Color" done at Lincoln Center awhile ago which dealt with the same subject of what happens to all the free people under Spanish and French rule in the Louisiana Purchase territory that gets destroyed by joining the United States with their horrible slavery. This was even better as it was from the female point of view. It's a very gripping story. Unfortunately some of the accents were a bit thick that made it hard to understand the dialogue on top of the loud background music. The costumes by Angelina Scantlebury were gorgeous. A very talented cast brought this steamy story to life. TAKING A BREAK TO PREPARE FOR GREAT THINGS AHEAD!